Lamezia Terme is a beautiful town in the Province of Catanzaro – centrally located in the mesmerizing Calabrian region. It is sandwiched between the sandy dunes of the Ionian Coast and the dotting cliffs of the Tyrrenhian Coast. The beautiful historic town, formed from the unification of three towns, is surrounded by countless white, sun-soaked beaches and secluded bays and grottoes that add to the beauty of this picturesque landscape. This ancient city is proud of its historical legacy and natural beauty, which have made it a popular destination in Calabria. A hub of travelers, the historic city of Lamezia is well known for its Roman and Greek ruins, alpine landscape, and striking, ancient stone villages that lie at the foot of rugged cliffs and headlands running up and down the coast. The area around Lamezia boasts plenty of important artistic sites, including Roman, Norman and Greek temples, and Bourbon palaces. You can’t leave the Calabrian region without exploring this unique historical town! 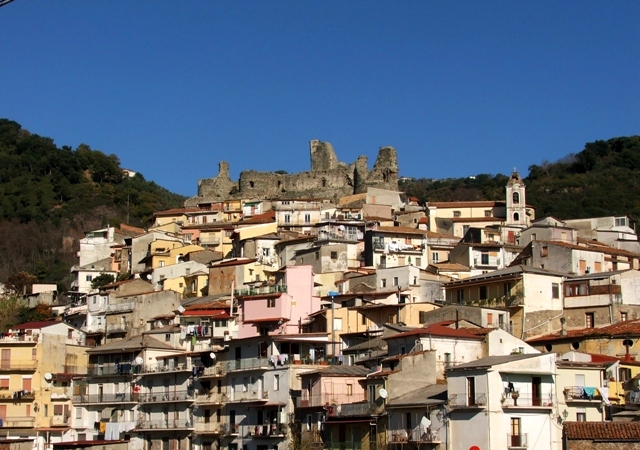 A fusion of three villages - Nicastro, Sambiase, and Sant’Eufemia di Lamezia - Lamezia Terme extends between the Calabrian Appenines and the Tyrrhenian coastal plain, with significant tourist and economic potential for the entire region of Calabria. Nicastro is the most important town of the three, with a famous cathedral and remains of a castle being the most popular attractions here. Built as a military outpost, the 9th century town continues to preserve its typically medieval layout, with its elegant palaces, churches, and monasteries. Damaged by subsequent earthquakes, the castle is an ensemble of ruins. Sambiase houses the parish church of San Pancrazio, with fantastic frescoes, statues, and pictures, and Baroque and Neoclassical buildings. You will find plenty of hot springs of Caronte nearby, which have remained a center of attraction for their hot waters that bubble at about 40°C. Tourists visiting the town for hot springs also love to explore the Mitoio National Park that stands adjacent to the Caronte hot springs, with rare species of plants. The town is also home to the main cultural institutions of the city. The 9th century abbey of the 40 Martyrs and the eco-museum of Lamezia continue to attract visitors. Sant’Eufemia is a modern town, built at the time of Greek colonization of Magna Graecia. The present quarter was created after drying a huge marshy area. The town boasts an archeological park that houses the ruins of the colonial architecture. You can also explore ruins of the Cistercian abbey of Santa Maria di Corazzo in Sant’Eufemia, dating to 1060. The Bastion of the Knights of Malta continues to preserve its identity and historical legacy as a huge, well-preserved watchtower dating back to 1550. You can also find ruins of several other watchtowers in the neighborhood. Situated at a stone’s throw from the Tyrrhenian Sea, Lamezia Terme is proud to be among the region’s chief cities, with an international airport that makes travel to and from the majestic city a breeze. A sparsely populated city, Lamezia preserves traces of the Greek colonization, housing some of the finest medals and coins of those times. If you wish to explore the historic past of Calabria, head straight to the beautiful town of Lamezia, which alternates between historic areas and its modern neighborhoods, boasting a remarkable and diverse cultural heritage. From "Lamezia Terme" back to "Destination Calabria"